Google does not send out webmaster warnings often so for those who are not used to seeing these it can be a little disconcerting. Nowadays most people are familiar with smartphone technology and the importance of being able to browse content online, but what exactly are the implications of receiving a notice like this? 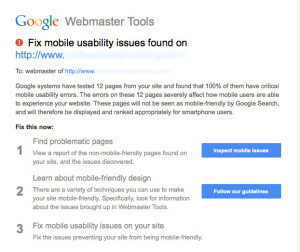 Google has stated in the webmaster blog that as of April 21st of this year (2015), their algorithms will be updated to affect web owners of non-mobile sites . 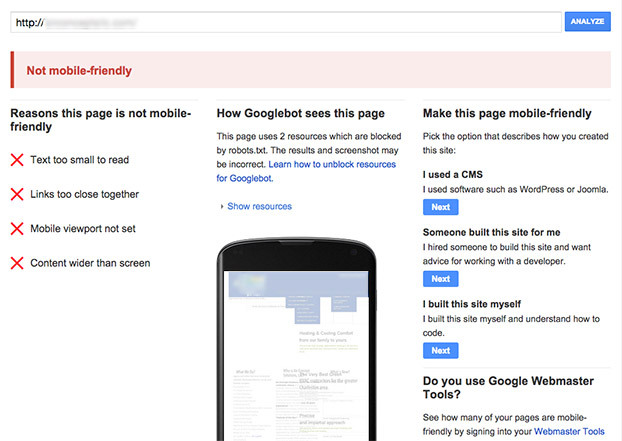 Does this mean that Google will not show your site at all? No, but it does mean that your site will be ranked with low priority, generally below all the other sites that are already mobile friendly. If you are a company that relies on people finding you online this can be a problem. As early as February of 2014, a report came out suggesting that 60% of internet access is via mobile device . Statistics shared by Smart Insights cite that 48% of mobile users start with search when they are accessing the web on their device . They also stated that 84% of smart phone and tablet users are using their devices as a second screen while they are watching TV. There is every expectation that this upward trend in mobile use will continue so while you might decide not to place making your website mobile friendly this quarter, it certainly should not be kept back burner for too long if you are trying to stay competitive online. 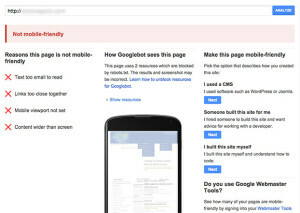 Google has provided some tools for web owners to assess their own sites. You can access their Mobile-Friendly Test Tool here and you will be provided with a report that outlines your site’s mobile deficiencies. Additionally, they provide some possible next steps if you decide you are ready to take action. There are several options for upgrading your site to mobile-friendly including separate mobile sites. I generally suggest the use of responsive technology which alleviate the SEO headache of duplicate content that site owners can have when they have two versions of the same site. If you do choose to create a separate mobile site with its own path, be sure to use Google’s canonical tag to let Google that your mobile site content is not duplicate (which can hurt your Google rankings). The tools I mention and links I mention here are all great starting places for getting acquainted with transitioning to mobile-friendly technology for your website. If you still have questions, feel free to send us a message and we’ll do what we can to help. 1. 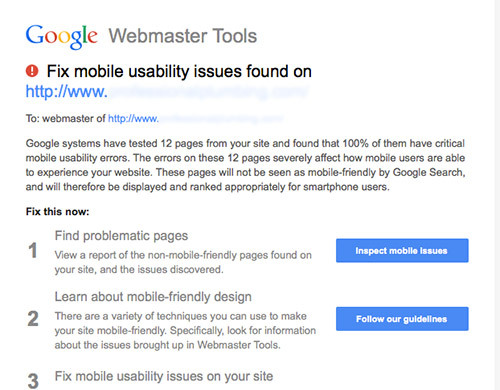 “Finding More Mobile-friendly Search Results.” Official Google Webmaster Central Blog. N.p., 26 Feb. 2015. Web. 03 Mar. 2015. 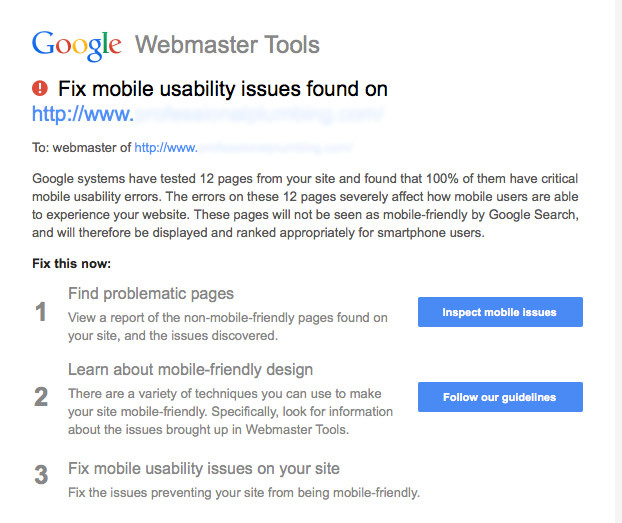 <http://googlewebmastercentral.blogspot.com/2015/02/finding-more-mobile-friendly-search.html>. 2. Sterling, Greg. “Report: 60 Percent Of Internet Access Is Mostly Mobile.” Marketing Land. N.p., 19 Feb. 2014. Web. 03 Mar. 2015. <http://marketingland.com/outside-us-60-percent-internet-access-mostly-mobile-74498>. 3. Bosomworth, Daniel. “Mobile Marketing Statistics 2015.” Smart Insights. N.p., 15 Jan. 2015. Web. 03 Mar. 2015. <http://www.smartinsights.com/mobile-marketing/mobile-marketing-analytics/mobile-marketing-statistics/>.